Zimbra: Bullet-Proof Email & Collaboration for productive teams. The Zimbra Collaboration suite allows you to stay connected with business-class email, shared calendars, file sharing, and tasks. 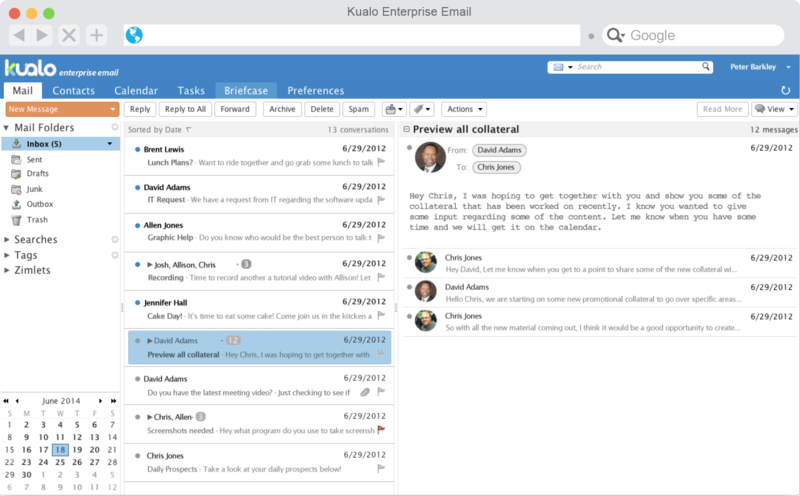 Connect with any mobile device or email software such as Outlook and enjoy full Microsoft Exchange compatibility, or use Zimbra's intuitive web-based interface. Innovative features such as Conversation View, Priority Inbox, Advanced Search, Filters, Tags and more help put you in charge of your Inbox and take control of the daily email deluge. With Zimbra Calendar you can create calendar invites, track responses & manage resources such as meeting rooms and projectors without leaving your email program. Store your documents in your Zimbra Briefcase and you’ll always have access to them. You can even share them with colleagues too. Keep your contacts synced across your devices preventing duplicates and ensuring you always have the correct, up-to-date contact information. Providing you a secure and powerful chat platform to use company wide using your same Zimbra login details. Whether you use an iPhone, iPad, Android or Blackberry, it’s supported. In fact even Windows Mobile is too. All of your data, always at your fingertips.